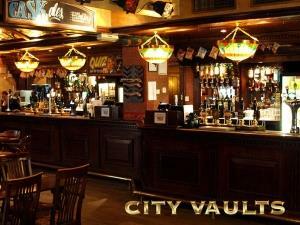 The City Vaults01274 739697work Public HouseThis bustling city centre pub is an imaginative conversion of a former bank premises opposite the well-known Wool Exchange. Art-deco glass features and wrought ironwork are present throughout. Of particular note is the wrought-iron spiral staircase to the upper drinking area. There are numerous interesting pictures and framed newspaper clippings on the walls. Three ales are available on handpump. Good value food is served all day (until 6pm on Sat & Sun) and all-day breakfasts are offered. Live music often features on a Saturday and jazz on a Sunday. A popular quiz takes place on Wednesday nights. This bustling city centre pub is an imaginative conversion of a former bank premises opposite the well-known Wool Exchange. Art-deco glass features and wrought ironwork are present throughout. Of particular note is the wrought-iron spiral staircase to the upper drinking area. There are numerous interesting pictures and framed newspaper clippings on the walls. Three ales are available on handpump.